HMS Endeavour, also known as HM Bark Endeavour, was a British Royal Navy ship commanded by Lieutenant James Cook on his first voyage of discovery to Australia and New Zealand from 1769 to 1771. Launched in 1764 as a coal carrying ship Earl of Pembroke, she was bought by the Navy in 1768 for a scientific mission to the Pacific Ocean. She was also to search for the unknown southern land, Terra Australis Incognita. Renamed as His Majesty's Bark the Endeavour, she left Plymouth in August 1768. After sailing around Cape Horn she reached Tahiti to see the 1769 transit of Venus across the Sun. She then set sail into the largely uncharted ocean to the south, stopping at the Pacific islands of Huahine, Borabora, and Raiatea which Cook claimed for Great Britain. In September 1769, she anchored off New Zealand, the first European vessel to reach the islands since Abel Tasman's Heemskerck 127 years earlier. In April 1770, Endeavour became the first ship to reach the east coast of Australia, when Cook went ashore at what is now known as Botany Bay. Endeavour then sailed north along the Australian coast. She ran into the Great Barrier Reef near Cape Tribulation. The crew were able to get the ship onto a beach on the mainland. This is now the site of the town of Cooktown. They stayed for seven weeks so that basic repairs could be made to her hull. On 10 October 1770, she limped into port in Batavia in the Dutch East Indies for more substantial repairs. She left on 26 December, rounded the Cape of Good Hope on 13 March 1771, and reached the English port of Dover on 12 July, having been at sea for nearly three years. The Endeavour spent the next three years shipping Navy stores to the Falkland Islands. She was renamed and sold in 1775, but was used as a troop transport during the American Revolutionary War. She sunk in a blockade of Narragansett Bay, Rhode Island in 1778. Her wreck has not been found, but relics, including six of her cannons and an anchor, are displayed at maritime museums worldwide. A full size working copy of Endeavour was launched in 1994 and is berthed alongside the Australian National Maritime Museum in Sydney Harbour. ↑ Knight, C. (1933). 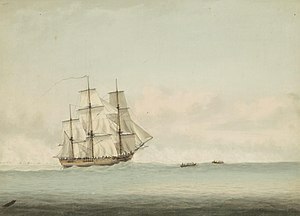 "H.M. Bark Endeavour". Mariner's Mirror (United Kingdom: Nautical Research Guild) 19: 292–302. This page was last changed on 10 December 2017, at 18:24.